Mitchell Rose, of Brooklyn, is selling sneakers fashioned after President-elect Barack Obama for $59.99 a pair. A Brooklyn man is selling sneakers fashioned after President-elect Barack Obama. Mitchell Rose is hoping to cash in on Obama's popularity with a pair of sneakers designed with the basketball-loving President-elect in mind. 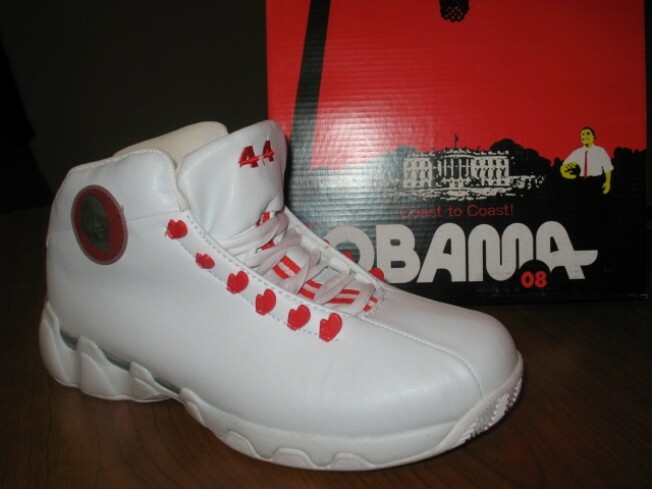 Rose's "Obama '08" sneakers sell for $59.99 and come in white and black. The name "Obama" is stitched to the heel of the shoe, and the number 44 is stitched to the tongue in honor of the soon-to-be 44th President of the United States. A rubber portrait of Obama's face on a red background on the side of shoes, which were made in China. Rose is selling the sneakers from his car in New York City, but he plans to head to Washington D.C. next week for Obama's inauguration. The price of the sneakers will drop to $44.99 after the inauguration in honor of the 44th President. The sneakers have mini boxing gloves stitched along the laces that glow in the dark.